Soigneur was born in the Netherlands in 2012, when we set out to create an independent magazine celebrating cycling culture. The eighteen editions we’ve produced since have paid homage to the breadth of the sport, all over the world, both in writing and with photographs. 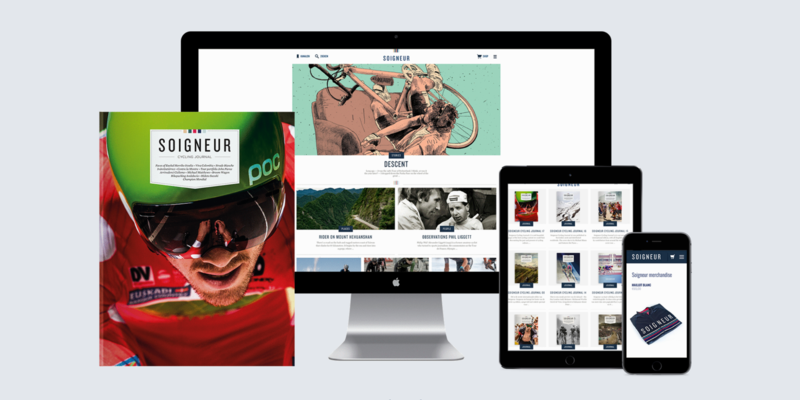 Soigneur brings together some of the finest stories, reportages, and photo-essays from around the world, online and in print. You’ll find tales of the past and of the present, of pros and of amateurs, of local heroes and of faraway places. Tales of suffering and of bliss. For the love of cycling. Soigneur works closely with brands that are in touch with our target audience and that offer value to the Soigneur brand, and vice versa. We believe in the power of beautiful content, and so do our partners. Soigneur provides the perfect platform for those brands to tell their stories, through the balanced mix of creative content, advertisements and smart activations and events, both offline and online. Our media kit provides information about our audience, reach, 2018 schedule and it presents propositions to our (future) partners.